It’s been a while since we posted here. Today we are celebrating the annual Games Developer’s Conference with a limited time half-price sale. The GDC convention is taking place in San Francisco from March 19-23. So, each of our individual collections is 50% off until Friday. Use the promo code GDC2018AB at the checkout (instructions) to take advantage of the deal. Note: the sale is now over. Subscribe to our free newsletter to be notified of new deals and discounts! Check out our whoosh, drone, user interface accents, or beeps and buzzers sound libraries to help augment sci-if or fantasy game titles. They’re on sale for $9.50 each. 347 stuttering, distorted, and scratchy glitch accents and tones in 536 megabytes. A mixed bundle of 1,215 real-world whooshes. Swooshes from natural and bizarre sources in 895 MB. Almost 530 and ~2 GB of sound design communication, signal, and interference tones & accents. Want to twist cool vehicle engine effects into sound design elements? The fighter jet (library one, library two), race car (library one, library two), howitzer, and steam train collections provide good building blocks for new creations. Our metal and glass elements libraries each provide hundreds of textures clips captured from three distances for ample designing flexibility. Designing a real-world game instead? Choose from 1200 clips in our human, kitchen, household, bathroom, and office packs. They’re each now under $10. 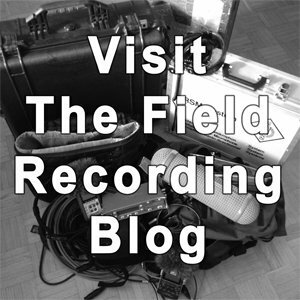 We offer many other sound collections ranging from tools to trains and cars to crowds. 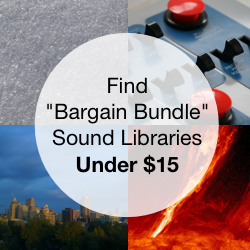 Browse all our sound libraries. 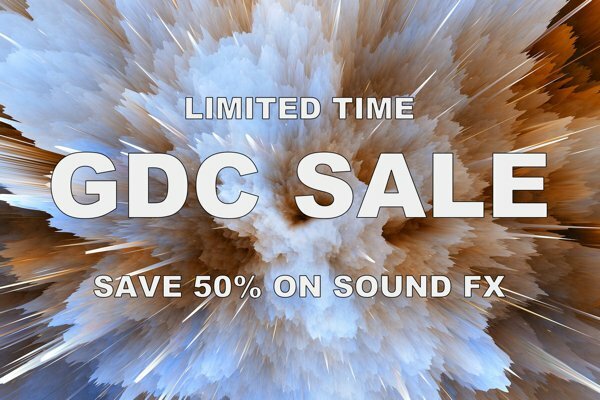 Save 50% off these sound libraries by using the coupon code GDC2018AB on the checkout page (instructions). This promo code is good for the next 48-hours only. 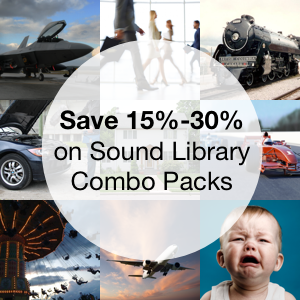 View all sound effect collections.